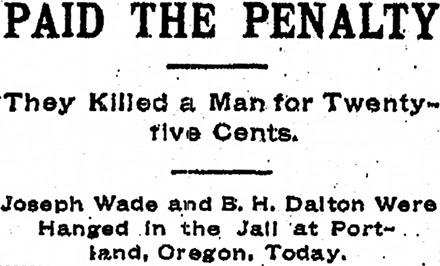 The U.S. states of Washington and Oregon both hanged murderers on this date in 1902. The death knell for local public(ish) hangings in Oregon took place this morning in the courthouse of Portland’s courthouse under the eyes of 400 invited witnesses and numerous additional gawkers who scaled telegraph poles or stationed themselves on nearby rooftops. Jack Wade and William Dalton hanged together for murdering one James Morrow just three months for two bits. It was an uncomplicated crime: the villains stuck Morrow up as the latter returned one night from paying court to a young lady, then shot him when Morrow made a sudden move. While the hanging itself went off without a hitch, the curious onlookers pushed through the rail meant to restrain them once the bodies were cut down and began scrabbling for bits of hemp. The sheriff finally had to clear the courtyard. Wade and Dalton weren’t actually the last to hang publicly(ish) in Oregon, however. Since the law wasn’t retroactive, several additional executions occurred after the penitentiary-hanging law was enacted — the last as late as 1905. (See Necktie Parties: A History of Legal Executions in Oregon, 1851-1905). Chinese immigrant Lum You was hanged at South Bend, Washington on January 31, 1902. He shot a man named Oscar Bloom during a drinking bout that turned into a drunken bout.